By Zack Quaintance — Our previews feature is back after a week hiatus during our trip to San Diego. Last week we did, however, roundup our picks for SDCC 2018’s 10 Coolest Comics Announcements...so check that out if you haven’t already. Anyway, no use in belaboring it...on to the previews! 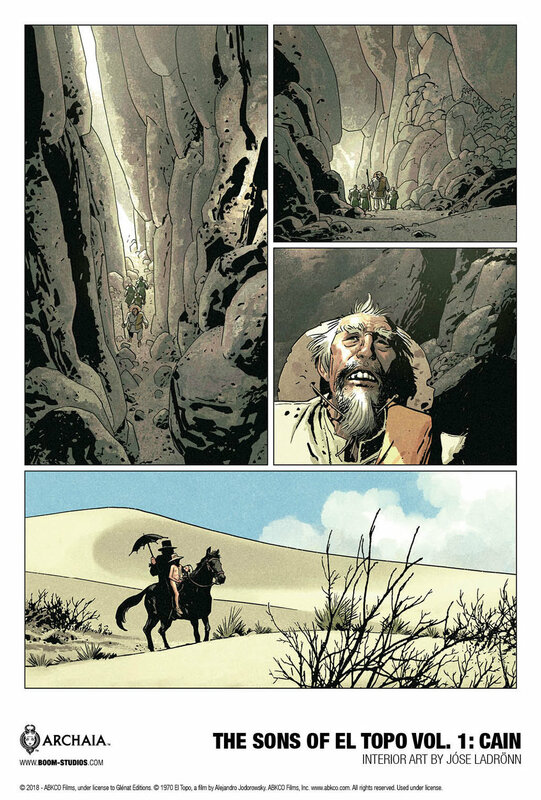 This is a hardcover original graphic novel from legendary filmmaker Alejandro Jodorowsky (Dune) and virtuosic illustrator José Ladrönn (Incredible Hulk) that continues the 1970 Mexican Acid Western film written, scored, directed by and starring Alejandro Jodorowsky himself. This sequel, arriving in stores December 2018, tells the story of El Topo—a bandit without limits and a man with no moral compass. But when his journey through the arid west brought him face to face with a series of rogue outcasts, he found enlightenment in the unlikeliest place and was forever transformed, becoming a holy vessel imbued with the power to perform miracles. This was a journey that took him far from his first born son, Cain, and brought about the birth of Abel. Our Take: We love Jodorwsky (as much for his films as for his candid appearance in the all-time great art documentary Jodorwsky’s Dune), and while this presumably means an end to any chance of Jodo making a cinematic sequel to the first film, his comics are always imaginative and worthwhile. Oh, and the Ladrönn art is is just stellar. Our Take: Oooooo, shiny. Sam Humphries sensibilities and Jen Bartel’s art are such a wonderful fit, and look how nice it is washed over with all that neon. We’re not entirely sure what neo-noir fantasy means, but it looks like we’re in for some big magic fight in hella trendy LA. So, that’s cool. Our Take: Cards on the table...we haven’t read Bone Parish #1 just yet, but it was one of those books that half our Twitter feed (roughly) turned out to tell us to read. So, we’re on board with that and we’ll get to it when we have chance, plus also this second issue, too. The power's back online and the fighting is over... but who are the real victors of HARBINGER WARS 2, and what was truly lost in the carnage? For those who survived the terrible onslaught - and who must now witness the devastating aftereffects of their actions - will there ever be peace again? As the seismic summer event of 2018 comes to a close, Eisner Award-nominated writer Matt Kindt (X-O MANOWAR, ETERNITY) sorts through the rubble of the most brutal confrontation ever felt in the Valiant Universe - and discover what lies beyond the bloodshed! Our Take: It’s all in the solicit, isn’t it? Who ARE the real victors? We’ve enjoyed this event quite a bit (more than most Big 2 Events, incidentally), and what kind of savage would read and like an entire event and bail for the aftermath? Not us….not us. Our Take: Save the last dance, indeed! Like the Harbinger Wars 2 event serving as a refreshing alternative to Big 2 events, this 4-part series has been a refreshing proximation of Big 2 fun and irreverent character takes. Kibblesmith is pretty funny guy, both in terms of writing comics and on Twitter, too. There is a level of novelty to Harbinger Wars 2 #2 that Marvel and DC are no longer capable of reaching. By Zack Quaintance — Harbinger Wars is one of the first superhero events in a long while that feels totally justified, in large part because Valiant hasn’t overdone its crossovers. It's a luxury Marvel and DC no longer have, and it adds a level of relevance to this huge story, taking it to a significant place those larger publishers are perhaps not capable of reaching, not anymore. This all occurred to me about halfway through Harbinger Wars #2. Long-running characters were meeting/fighting on the page for the first time—what was this feeling? The story seemed...important? Maybe not quite that, but it at least seemed novel. It was a feeling I remembered from when I was a much younger reader, and the Big 2 had a few relationships that weren’t quite as rote as they are nowadays. In recent years, event stories at those publishers have seen characters take self-aware, here we go again attitudes toward massive galactic threats. There are exceptions, of course (Hickman’s Avengers stands out), but for the most part, the major dangers of the galaxy or multiverse are met with a wink. As a younger publisher with less continuity, however, Valiant has the luxury of acting like they haven’t been here before, despite this all being a sequel to a previous event. That to me is the single greatest strength of Matt Kindt and Tomas Giorello’s Harbinger Wars 2 #2. Not to give specific plot points away, but there were fights here that had me rooting for both sides with no idea what would happen, which is very rare for superhero comics. There were also character interactions that felt weighted and poignant, like the world depended on them, even if it was just two heads talking. That’s no easy feat, especially given one scene in particular that involved characters Kindt hasn’t recently been writing. This issue works really well for the most part, even if Giorello’s hyper-realistic artwork felt a little out of place for characters that are usually depicted by less realistic artists, like Animalia and Faith. The range of emotions in this book is pretty stunning, though, specifically in a scene where Kindt uses a young psiot to remind us of something Marvel’s X-Men used to do better—that many of these abilities make lives worse, much much worse. It’s a brief scene of well-tread thematic space, but it’s well executed, reminding us of the human stakes behind the superhero war. I’ve always thought of Harbinger as Valiant’s answer to X-Men, which is, admittedly, a fairly obvious comparison to draw. Harbinger Wars 2 #1, however, was actually a really nice reminder that this franchise’s significantly more under-the-radar status allows it a degree of agility the now-hulking X-Men behemoth no longer has, and it uses that degree expertly in this issue to play upon current societal woes and concerns. Essentially, the first part of this summer’s Harbinger Wars 2 event is a poignant and engaging story, involving nearly all of Valiant’s best characters (where’s the Eternal Warrior at these days, btw?). As it should. The Harbinger concept to me is the center of Valiant’s universe (or was until Divinity showed up, anyway), and this event is poised to treat it as such. It’s yet another tale of superheros turning against each, and as common as that has become these days, doing it convincingly is still tricky business. Without giving anything away, I’ll say this book handles it better than most in recent memory, rich as it with solid and believable motivations for the involved heroes to take their respective sides. The action of the shadowy government types here are a little harder to fathom, as they almost always are, but I digress. But let’s keep it abstract, seeing as this is an advanced review (this book drops May 30) and I don’t go in for spoilers. Let’s get away from details and talk about the commentary. In a sense, the themes in Matt Kindt’s script are nothing we haven’t seen done or attempted by X-Men several times over the years: an outcast population, children on the run because of who they are, a government acting out of fear, a debate over what constitutes proper methods of resistance. Kindt, however, is an incredibly nuanced writer who doesn’t need to hit us over the end with any of that to make this story compelling. He puts all those questions and themes in here seemingly as a mechanism for understanding the reasons our characters have for fighting, then he gives them all plans that start to pull them together. Each page pulls our opposed characters closer, revealing more about their motivations as it does so and setting the stage for a massive rumble to come. There’s a cinematic quality to this story, in both its structure and scope, as well as in the way characters from various Valiant franchises are introduced, presented in big splashy panels as if they were leaving room for an applause break. Tomas Giorello hits the artwork here out of the park, as he has during previous collaborations with Kindt in Valiant’s best ongoing right now, XO Manowar.